Twenty-five years ago, Canadian serial killer Karla Homolka struck a plea deal with prosecutors in return for her testimony that her husband, Paul Bernardo, raped and murdered at least three minors in a series of grisly deaths that began with Homolka’s younger sister Tammy. Convicted of manslaughter and sentenced to a mere 12 years in prison, Karla served her time and walked free in 2005, despite the fact that videotapes were discovered during the trial that clearly showed her complicity in the gruesome crimes. Homolka and Bernardo were household names in Canada throughout the 1990s when author Jennifer Hillier was growing up in Toronto, and the news coverage made a big impression on her. Hillier often wondered how Homolka was able to restart her life upon her release. Media accounts allege that Homolka married, changed her name, bore three children and is now volunteering in her children’s elementary school in Montreal. Hillier marveled at Homolka’s audacity and her ability to put the past behind her, and set out to write a novel that would explore the limits of forgiveness, redemption and renewal. 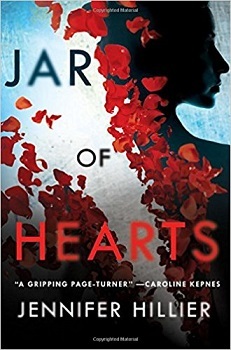 Jar of Hearts follows the story of Georgina Shaw, known as Geo, a successful executive at a Seattle pharmaceutical company. One day, police raid her corporate boardroom and lead Geo out in handcuffs, charged as an accessory in the murder of her close high school friend Angela Wong 14 years prior. Angela and Geo’s other high school pal, Kaiser Brody, is now a detective for the Seattle Police Department, struggling to resolve his longtime crush on Geo with the knowledge that not only did Geo know where Angela’s body was all these years, but she also played a role in Angela’s death. The narrative alternates between different perspectives, following Geo’s experiences serving her five-year prison sentence. Little by little it comes to light that Geo’s high school romantic obsession with a charismatic but deeply disturbed older man, Calvin James, set her on a terrible path. Though Calvin lands a lifetime prison sentence as the Sweetbay Strangler, he manages to escape. Then, just as Geo is about to be freed, several bodies are found, murdered in the same way that Angela was. Is it Calvin? Is Geo in danger? Can she ever escape her past and build a future? Readers need to have a high tolerance for gore and sexual violence before choosing this book, but if you like Chelsea Cain or Gillian Flynn, or Hillier’s favorite novelist Stephen King, you should be all set. Hillier serves up a good helping of twists and turns and overall creepiness, all with a Seattle backdrop. The title is a reference to Christina Perri’s 2010 somber pop single, which would make a good soundtrack while reading.